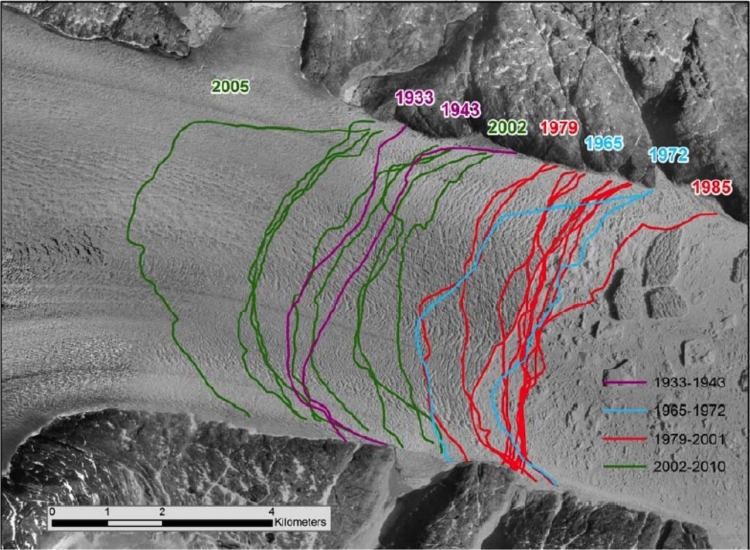 NASA research shows that Jakobshavn Glacier, which has been Greenland’s fastest-flowing and fastest-thinning glacier for the last 20 years, has made an unexpected about-face. Jakobshavn is now flowing more slowly, thickening, and advancing toward the ocean instead of retreating farther inland. The glacier is still adding to global sea level rise – it continues to lose more ice to the ocean than it gains from snow accumulation – but at a slower rate. In a study published today in Nature Geoscience, Ala Khazendar of NASA’s Jet Propulsion Laboratory in Pasadena, California, and colleagues report the change in Jakobshavn’s behavior and trace the source of the cooler water to the North Atlantic Ocean more than 600 miles (966 kilometers) south of the glacier. The research is based on data from NASA’s Oceans Melting Greenland (OMG) mission and other observations. The whitewash of this evidence is already underway e.g…. ‘While this is “good news” on a temporary basis, this is bad news on the long term’. “The glacier is still adding to global sea level rise – it continues to lose more ice to the ocean than it gains from snow accumulation – but at a slower rate”. 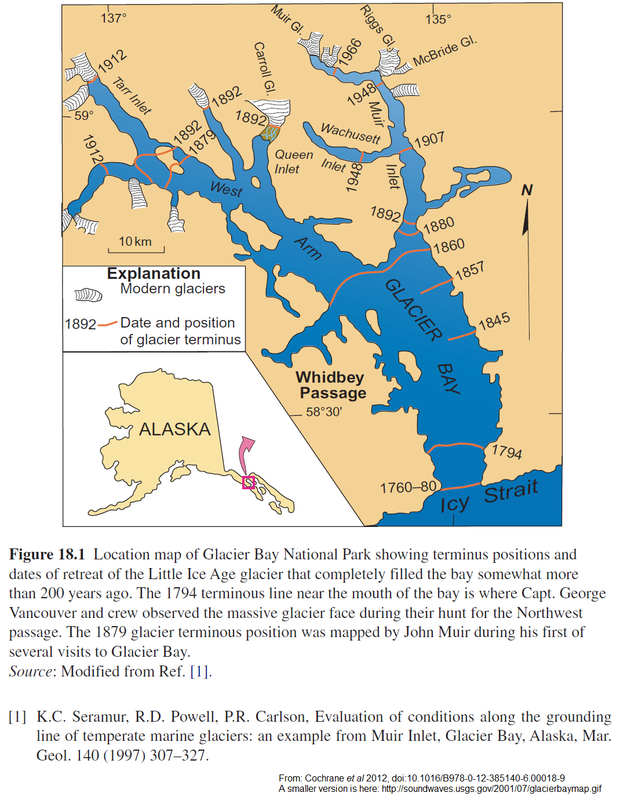 I always thought that glaciers advanced when snow accumulation increased. And why is it advancing TOWARDS the ocean instead of retreating further INLAND if the water in the ocean has turned cooler? I wondered the same thing, Graeme No.3. If Jakobshavn is now “thickening, and advancing toward the ocean instead of retreating farther inland,” then how can it also still be losing ice? If it is lengthening and thickening, where’s it losing ice? can you say, “confirmation bias”? They clearly don’t look at their satelite data even when Tony Heller points it out to them. 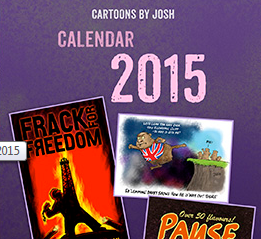 Time to back off the ‘rapidly warming’ propaganda? I do sometimes wonder if the intensified demands that we must act now are not just the result of politicisation but because scientists are nervous about a reversal of warming. Dave Burton: Thanks. 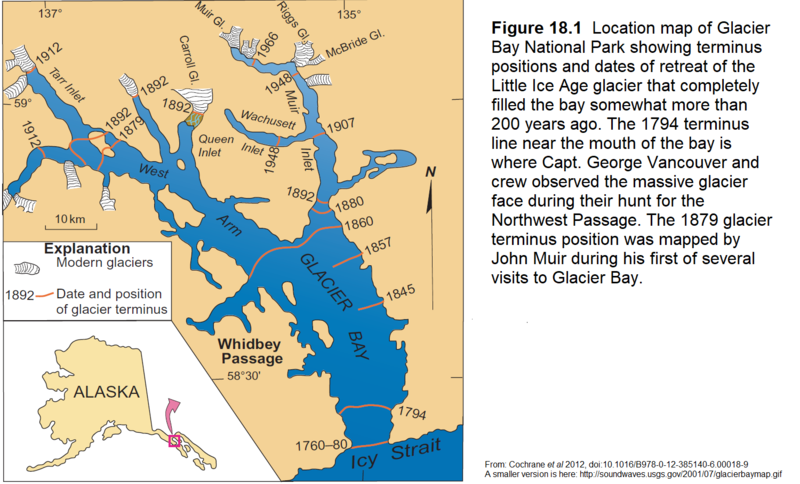 Will file that with the map of Glacier Bay https://soundwaves.usgs.gov/2001/07/fieldworks2.htm. “Things were looking bad around southeast Greenland a few years ago. 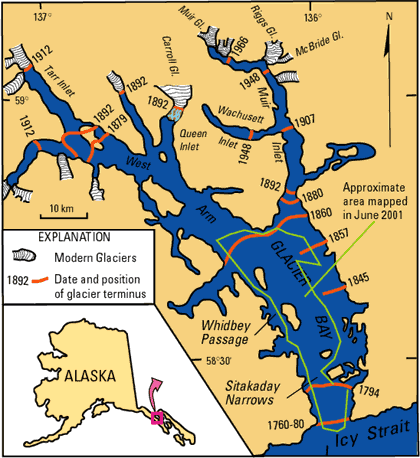 There, the streams of ice flowing from the great ice sheet into the sea had begun speeding up in the late 1990s. Then, two of the biggest Greenland outlet glaciers really took off, and losses from the ice to the sea eventually doubled. Some climatologists speculated that global warming might have pushed Greenland past a tipping point into a scary new regime of wildly heightened ice loss and an ever-faster rise in sea level. “So much for Greenland ice’s Armageddon. ‘It has come to an end,’ glaciologist Tavi Murray of Swansea University in the United Kingdom said during a session at the meeting. ‘There seems to have been a synchronous switch-off’ of the speed-up, she said. 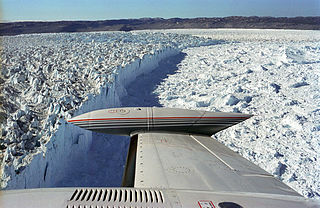 Nearly everywhere around southeast Greenland, outlet glacier flows have returned to the levels of 2000. An increasingly warmer climate will no doubt eat away at the Greenland ice sheet for centuries, glaciologists say, but no one should be extrapolating the ice’s recent wild behavior into the future…. 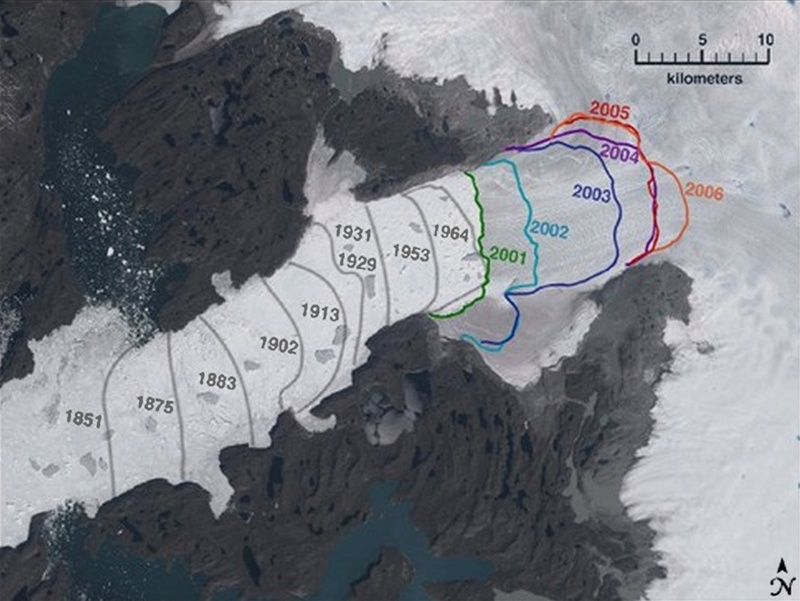 Interesting how the glacier hardly changed between 1964 and 2001! That link doesn’t work for me. Did you mean this one? But they’re all pretty stale. Do you know where there’s a newer version? NASA has a visualization here ending in 2006. Nothing much happened (?) between 1942 and 1997, in terms of net change, but it seems there was some backwards and forwards motion (see second image below). The deep water warms through most of the 1990s, but cools dramatically after 2015. The glacier is flowing freely until it hits the cill below it’s present calving front, there’s so much ice sliding into the fjord it can’t retreat much before it refills, the whole fjord is full of saline water, tidally driven, back as far as the round feature, about the middle of the image. That knocks the bottom out of greenhouse gas theory. Wasn’t the ‘missing heat’ supposed to be hiding in the oceans? It’s all nonsense and they are running out of places to hide. Last spring, I pointed out that Greenland’s Jakobshavn Glacier has been growing since 2012, after 170 years of retreat. 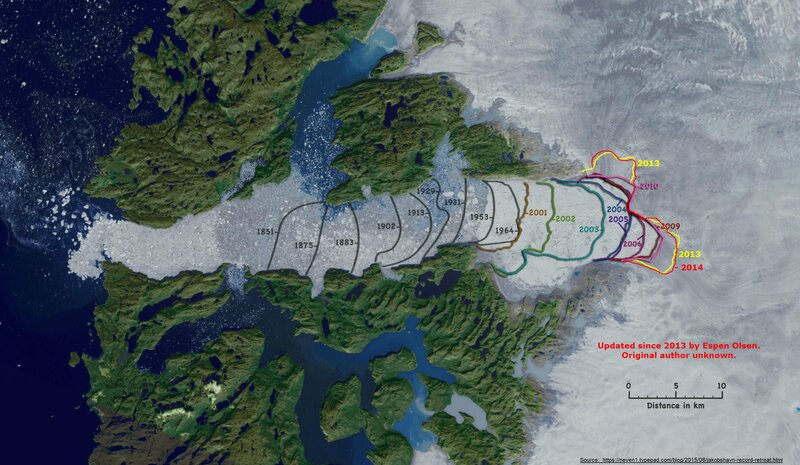 Greenland’s second largest glacier, the Petermann Glacier, has also been growing since 2012.